Day 1 : All the participants are requested to assemble at Tourist Rest House GMVN . 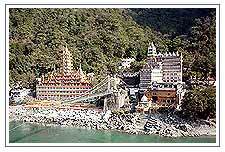 Munl-ki-Reti, Rishikesh. Dinner and overnight in TRH Muni-ki-Reti, Rishikesh. Day 2 : 136 kms. drive to Pauri. Lunch enroute. Arrival Pauri. Sight-seeing programme at Pauri. Dinner and overnight at TRH Pauri. Day 3 : 1-4 kms. drive to Thalisain with pack lunch. Dinner and overnight in camp. Day 4 : 13 km trek to Piersain with pack lunch. Dinner and overnight in camp. Day 5 : 7 kms. trek to Binsar with pack lunch. Dinner and overnight in camp. Day 6 : 20 kms. trek to Gairsain with pack lunch. Dinner and overnight in camp.